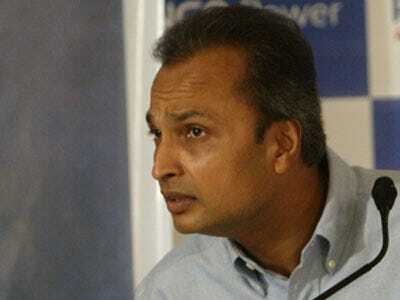 India’s giant telecom scandal is picking up steam and has just ensnared the country’s fourth richest man.rumours that Anil Ambani met with telecom minister Kapil Sabil as part of a government probe caused all stocks related to his $81-billion-conglomerate to collapse. Reliance Infrastructure (RLIN.BO) plunged the most and eroded 18.8 per cent, with more than 4 million shares traded on the BSE, which is nearly 12 times the average 30-day volume. Reliance Communications (RLCM.BO) tumbled as much as nearly 18 per cent to an all-time low of 90.80 rupees. It later recovered some losses and closed down 14.3 per cent. Around 6 million shares exchanged hands, which is more than four times their average 30-day volume. Other group companies Reliance Capital (RLCP.BO), Reliance MediaWorld (RELM.BO), Reliance Power (RPOL.BO) dropped between 8.9 per cent and 16.1 per cent. Ambani blamed the selloff on “vicious and illegal bear hammering” and asked the Securities and Exchange Board to investigate, according to Business Standard. Stock in another big company, DB Realty, dropped yesterday after Managing Director Shahid Balwa was arrested in connection with the scandal.